Hey all. Beta's back in town for the holidays, and she's been playing Spore recently. Yesterday she built up her first predatory species, the Opochs. These things are some of the funniest looking things you've ever seen, with elephant like trunks and tusks and goofy eyes. She befriended a giraffe critter, and took it along with her on her conquests in Creature phase, and it was so funny to see this Giraffe killing things. It was like, "I'm a carnivore, really!" as it tried to kill other creatures. We grew attached to the silly thing as it tried so hard to fit in. It was a sad time when it finally got killed, since neither of us knew where to go back to for more. Also during this game, Beta was buzzed by my Enterprise UFO that I use in my main game, which proceeded abduct Bluubies while she was trying to eat them. She eventually found my ship crashed in the ground (see pic), which honestly didn't surprise either of us. I mean, it was my creation, y'know? Later last evening she set forth to get the achievement for befriending 20 species in a single game. She ended Creature phase with nearly 30 allies, which was impressive. I can't do that; I'm not patient enough. Later, all. I've posted my first retro review on e-AAGH.net today. Many of you may have seen the link to my retro/late section has been there since my redesign, but it wasn't until today that I finally stuck an article there. What did I review? World of Warcraft, of course. As in the original. My late section is for games from the last few years (during e-AAGH.net's life span or so), and the retro is for two console generations or six+ years ago. Naturally, WoW ended up in the Late section. Mentioning e-AAGH.net's life span brings me to my next point: In 2009, e-AAGH.net will be five years old. I hope to make that anniversary something special, so hold on tight and see what I come up with. I'm happy we've made it this far, and I credit all of the traffic I've gotten and the support I've received for it's success. That's all for now. Later, all. I've been playing Wrath of the Litch King (WoW's second expansion, for the one person who somehow hasn't heard) only since last Saturday, and in reality, I didn't play at all yesterday, so this is really just my second day with it. Still, I have had a few observations that I wanted to pass on, review-wise. For more character and game-driven posts, see Alazar. The Death Knight class is cool, with a very story-driven opening series of quests, but are disorienting to me. I wasn't sure what I was doing with my powers or the talent points I was accumulating, so I had to wing it allot and hope I was doing the right thing. Fortunately, I visited WoWhead.com beforehand and had already planned out a map for my first 40 or so talent points, so I wasn't totally in the dark. The quests in that opening sequence involve several mount-based quests, such as a cannon and the Litch King's frost wyrm. This introduced me to a new vehicle interface, which promptly effed-up my Titan Panel add-on. I got the new TP build to fix that, but it was pretty frustrating at the time. The vehicle interface is pretty handy, though, and gives you a different feel for the game while you use them. Again, for more detail on my experiences not pertaining to my review, see Alazar. I'll have my review up... eventually. It'll be a while, so don't hold your breath. Later. You don't hear much from me or Beta about Omega. He's a dude I've known for about 15 years or so, and he's my most dedicated gaming buddy. He's been around the allot the last few days, and I've gotten him hooked on Age of Empires III: The Warchiefs. I have also in the past turned him on to Age of Empires II, Empire Earth 1 and 2, and Rise of Nations. We've played a couple of games in AoE3 lately, so I thought I'd share some of our matches, in recap form. We played starter cities, me as the Russians and he as the Brits. We took on an even number of AI's, and while he fuddled with the controls, learning the ins and outs of the game, I steamrolled our foes into oblivion. Elapsed time: 26 minutes. Omega wasn't happy after our first game, since he didn't get to do anything. He wanted to drag out the second game, so I just built up a small army and awaited his say-so to begin my attack. I must admit: I'm an artillery freak. I love to bring big guns to bear on my enemies. The bigger the boom, the happier I am. I'm the guy you'll meet in Empire Earth who'll swarm you with bombers and cannons, with a few lighter troops to protect the big guns, only to finish the job with 10+ nuclear bombers.. Anyway, I built about 15 mortar cannons and got a few dozen troops through shipments from my home city. Omega, on the other hand, brought in - I swear! - over 170 troops. It was typical Omega-style warfare: quantity over quality. In the end, we attacked the five opponents we had and blitzed them completely. Elapsed time: 1 hour, 26 minutes. The next game saw us both going to my main city, a level 21 German city. We again, as last time, played on the Caribbean map, which put us on an island with one ally against about four AI's. I again went for my heavy artillery attack, since I wasn't going to be the bulk of our army anyway. I had around 10 imperial howitzers and a few dozen Doppelsoldners and Uhlans. Omega again fielded his army of 150+ random troops. I used a large navy to claim the seas near our island, and after we took the neutral island, we soon hit the limit cap and eventually built everything there was to build and maxed everything out, so we (or rather, he) decided it was finally time to assault the AI, which didn't put up allot of a fight. Elapsed time: 2 hours, 31 minutes. This game saw us on the Saquenay map, teamed with Napoleon against four AI's. Omega decided it would be a good idea to claim the map with walls, and proceeded to wall off a huge chunk of the map, bit by bit. I joined in for the heck of it (not much else to do until he gets bored and finally wants to go kill something), and made myself a few walled-in colonies near his base. For the first time, though, the AI fought rough. It began with the Russians and the Ottomans - at different times - attacking my main city. I built a small standing army to protect it, and they were busy the entire game. What was bad, though, was the orange nation (I forget who) attacked Omega and tore down a chunk of his wall before storming into his base. We had been marshalling our troops down near my base in the south, and they snuck past us and tore into his base in the north.We quickly squelched that attack, but the much-welcomed side benefit was that it pushed us to attack much sooner. I led the charge on a trading post in the east to break up a trade monopoly the other team had begun (Napoleon started one on us twice, and we had to break our own up to stop ourselves from winning that way). My pack of imperial howitzers dropped the trading post in one volley (as they do with most any building), and we began a clockwise blitzkrieg around the map. One by one we wiped out the AI cities, but - in a scenario reminiscent of a bizzaro-World War II - our German forces had to race Napoleon's French troops to the Russian capital so we could destroy it first. We did, and we won. Elapsed time: 1 hour, 35 minutes. Phew! That's allot of action. I'll post more if we get more games in. Later, all. The New Xbox Experience, Microsoft's attempt at updating their console's interface, has arrived at e-AAGH.net. Awhile back they asked for testers, and I of course signed up. On their last batch of test application acceptances (released today) before it launches on the 19th, I got selected. Sadly, I had no idea of my good fortune, since I didn't see an acceptance email in my inbox (or junk box, for that matter). I just happened to boot up my 360 to play some Madden 09, and got the update. I scurried back to the computer, and sure enough, I had accidentally deleted their email. Stupid Alpha. So, how is it? Allot better then expected, that's for sure. I didn't like the interface in pictures at all. I really liked the clean, sharp look of the old dashboard, so this facelift had allot of work ahead of it. So far, I've found that I actually like the way it's laid out. Everything is easy to get to, and it looks snazzy, too. My avatar (a Microsoft Mii, if you will) was fun and easy to create, although I miss Nintendo's option to create as many as I want. It's allot faster then I expected; I figured there would be allot of slowdown and/or lag in the interface, but there's not. I'll update with more information later. NBA 2K9 Reviewed for PC, at Last! I've finally reviewed NBA 2K9 on PC, after playing with my review for the last week or so. Why so long? Was it that critical to me to get it right? Is it that important? Were there that many changes needed? Nope, nope and nope: I'm just a nitwit. I wrote it on the evening of October 24th, but didn't post it. A day or so later I remembered I'd written it, but before I could post it I saw a change I wanted to make. I'd make the change, but forget to post it again. This happened about four times. I repeat: I'm a nitwit. In other news, I got my first taste of Fallout 3 today, and I'm impressed. You can expect to hear more on this later, and a review, for sure. Later, all. I recently picked up Wii Music, and I must say that for all of the negative press it's getting, it's a fun little title. People seem to want to compare this to Rock Band and Guitar Hero, and that's wrong. But that's for a review at a later date. I'm here to tell you a story of music done good, and music gone bad. I've figured out that, for me, percussion is my speed. Partly because I can cause the least damage there, but also because I have a natural habit of drumming to music I listen to. I liked going Animal on the F-Zero theme and keeping time on Jingle Bell Rock, and handling the underlying beat on the Zelda theme allowed me to cut loose and go a bit overboard on the cymbal/gong that comes with one of the big drums. I also like - in Wii Music, of course - playing the piano, acoustic guitar, trumpet and doing vocals. So versatile, that Alphasim! Actually, as I told Beta, one of my Twinkle Twinkle Little Star renditions was so bad it should be ruled criminal. I actually hate Twinkle Twinkle Little Star now, because the game made me play the stupid thing so many times. I am particularly proud of one vocal rendition of I'll Be There I put together, though. Beware! Beware! I threat lurks in the wild! Night Watchers, be on the alert! Having been in Duskwood many a time, I knew what that meant: Stitches was coming. I decided, having gained over ten levels since out last encounter, I was going to take him on. I met him just past the night watch post, and a battle was joined. Even with my Witchfury blade, a Winterfall Firewater battle elixir, healing potions, and my Lay on Hands spell, I barely finished him. He was doing about the same amount of damage I was, but he had around 10,000 more HP then me. Still, I lived, he didn't, and that's all that matters. I got his femur, but I don't know WTF I'm supposed to do with it... my sword's a two-hander, and I'm not downgrading just so I can carry a bone like some caveman. In other news, Xbox Live is down for today, as they make preparations for the New Xbox Experience, due later this year. I'm looking forward to trying it, but I still like the current dashboard, personally. Well, I'll leave you with this pic of me standing triumphant over Stitches. I'm proud of myself, even if I did only kill a level 35 elite at level 46. If only I had been able to get some XP out of the deal. Hey everyone. I've been playing WoW allot the couple days, and I've run into a few things to yammer about. For one, Lord Captain Wyrmak is evil. Plain and simple. The dude killed me twice in the Swamp of Sorrows last night (fittingly enough it was around the Pool of Tears lol) and I'm still mad about it. Once, I had him down to under 600 HP and was this close to finishing him when I ran out of mana. With my potions already on cooldown, I was stuck. And dead. I also ran into Somnus the dragon down there, but there was no way in blue blazes I was trying to tackle him! I also died twice trying to slay Gorlash. It was a bad night for me with elite mobs. Today, however, I killed a Deepstrider Giant in Desolace with relative ease, so I feel a little better. I've taken a liking to the SimpleMP3 and AutoBar mods lately. I use SimpleMP3 to play my game music soundtracks, and the Autobar has greatly simplified my interface. I recommend you give them a shot, if you haven't already. Also, I do NOT recommend MazzleUI. Not only is it overkill, I spent five and a half hours last night trying to configure it, and when it finally worked, I hated it. Bad Mazzlefizz! About Gavelier and his web comic, I'll be cutting back on the updates a little, to just a few a week. The daily updates are fun, but I don't think I can keep it up. Look forward to his future exploits! Oh, and all those troubles with elite mobs above? It was Gavelier I was playing. Poor guy! Hey all. First and foremost, I wanted to re-up my last post on the old blog for those who missed it. I've put more time into the the Public Test Realm, and I've got a few more opinions on it. For one, I'm a fan of the new Stormwind harbor, but it has some issues. For one, there's nothing to stop the Horde from sailing right in to Stormwind from Northrend. That seems like a design flaw, to me. Secondly, when you first arrive at the harbor from the city, you're faced with what looks like the way down, but no - it's a sheer drop to your death! Seriously, there needs to be a sign or something there, telling you to go around the small, almost hidden ramps to the sides. Sheesh. Secondly, I've re-specced to retribution from holy on my paladin main on my main server, so I did the same on the PTR, to great success. I rolled through Stranglethorn Vale at level 42 (2 levels behind my real avatar), slaying anything that got in my way with no fear. I took on lvl 44-45 mobs with impunity, and only stopped when my bags filled up with loot. Myself and another lvl. 42 retribution-specced paladin tore up a whole mess of lvl 44+ mobs in an old ruin without breaking a sweat. Does this mean that retadins are overpowered? Not in my eyes. It just means that we've finally caught up to the rest of the pack. 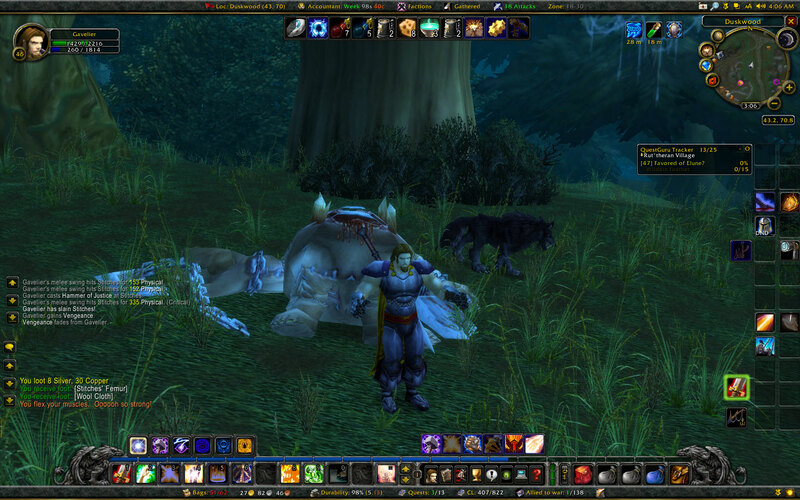 I can't handle mobs at my own level very well on my main server, but here I was able to solo higher level mobs. Not bad. Lastly, I'm a huge fan of the graphical improvements they've made, particularly with the lighting, or more specifically, the shadows. The dappled light effect coming through the trees down in Stranglethorn is beautiful, and reminds me allot of Fable, in a good way. I'm seeing shadows of birds flying overhead, too. It's gorgeous. I hope to see further improvements made along these lines someday in the future. On a related note, I'm working on a webcomic in the vein of Gamespy's Flintlocke comics, called Gavelier's World of Warcraft. Gavelier is the paladin I was talking about above, and here he goes on adventures with a couple of low-level characters. I hope everyone enjoys it. Later, all. Anyway, as for new stuff, I've been enjoying - of all things - PopCap's addition of a Bejewled add-on for WoW. I like how it can pop up during a flight and give you a game timed to your individual flight. For example, I flew from Stormwind to Booty Bay, and the add-on gave me a game once the flight started, and gave me until we landed to rack up as many points as possible. Very nice. It will also track your scores compared to your friends and guildmates. I'm beside myself that there's something to do during those long, boring flights besides going AFK for awhile. In other news, I again want to point you to Beta's Blog, in case you somehow missed it. Later, all. Welcome to the new and improved e-AAGH.net blog! I'm hoping that this will be the last blog change I make for a while. You can also stop by Beta's blog as well. Enjoy!